Hey everyone!!! I am very happy to say that the weather is much more spring like lately. Still a lot of snow to melt, but lots gone too. Now, for my woks in progress this week. I planned on finishing a couple of days ago, but didn't happen. Things get in the way once in a while,eh...lol. Now to bind this one.. 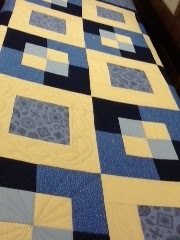 I have the t shirt quilt started....all fused and ready to cut the sashing strips. 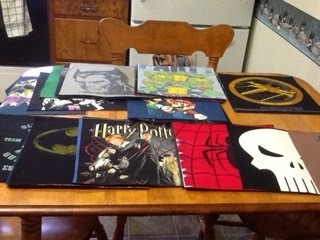 This is going to be a king size quilt. 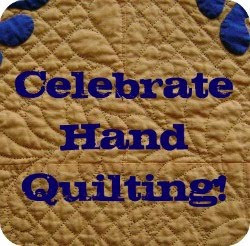 Next Monday is sewing day for about 10 of us at the church....fun and laughs!! This is the pattern and fabric I'll be working on that day. A DoNut/4patch quilt...lap size.the white is background, with the stack of charms. 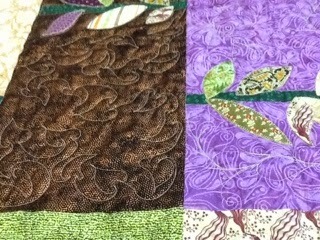 Then a narrow red border, then the outside polka dot border. 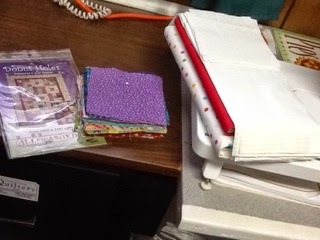 In a couple of days, I will have the next queen size quilt in to hand quilt, and I still have to do my pillow for the FMQ Challenge for April. I'm glad that it is starting to warm up a bit for you. 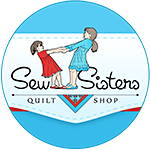 You are going to soon be busy outdorrs with less time for sewing. Lots of fun stuff going on in your house! 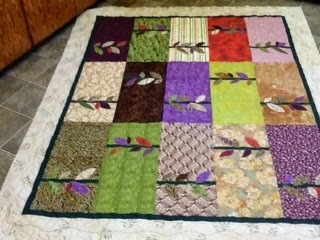 I love all that hand quilting you've done...beautiful!